336 B.C to 264 B.C. Zenon was born in Kitium (now Larnaca ) in Cyprus in 336 B.C. Whilst looking in a bookstore in that city, he came across certain philosophical manuscripts, and was so interested in their content, that he asked where he could find ' men who wrote and thought in such a manner.' At that moment the Cynic Crates was passing by, and Zenon followed him. From then on he became Crates' student and stayed in Athens. When he was 42 years of age, Zenon started his own philosophical school in a colonnade called the Stoa Poikile (painted porch) which was adorned with pictures of the Trojan war, Marathon and the Amazons by Polygnotus. His students were first called Zenonians and then Stoics ( after the nature of the decorations). Zenon had for a disciple Cleanthes, from Assos in the Troad (300-220), whose hymn to Jupiter is the only fragment of any length that has come down to us from the early Stoics. It is a poem setting forth the unity of God, his omnipotence and his moral government. Chrysippus, from Soli in Cilicia (280-207) followed Cleanthes, and in his voluminous writings both defended and modified the Stoical creed..
To Zeno belongs the establishment of the logical criterion, the adaptation of Heraclitean physics and the introduction of all the leading ethical tenets. He was a very humble man and took as his students poor and rich alike. He disliked mixing with Kings or the authorities. Zenon died as simply as he had lived, he just hanged himself when he thought his time had come. His ideas and the resultant stoic philosophy had a great impact on many of the important men of his day and the history of our civilisation. The principles of the doctrine are: The striving after equanimity, the hardening of ones self against the blows of fortune, the limiting of wants and the practice of contentment. Also a qualified form of the subordinating of "self" to the general welfare. As you can see these are also an essential part of most modern theories of virtue. 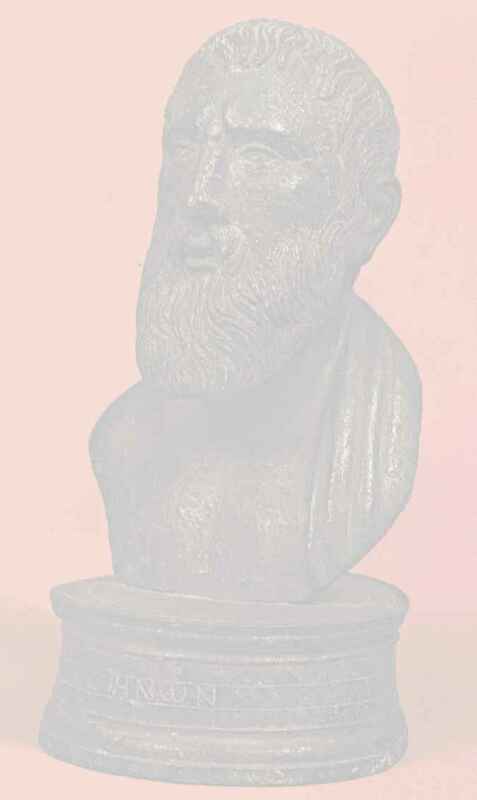 See: Zellers Stoics, Epicureans and Sceptics (Eng. translation 1870) A.C.Pearson. The fragments of Zeno and Cleanthes (1891) and works by Aurelius, Epictetus and Seneca Diogenes Laertius provides a very long summary of his ideas and those of the other Stoics. We in Larnaca also wish honour Zenon and so have put his portrait on the emblem of the municipality and (1998) was dedicated to events of a philosophical nature. On the 9th 10th and 11th of September we had the biggest and best ever in the whole wide world Philosophers Symposium with 18 great philosophers from all over the world as guests of honour, dedicated entirely to Zeno. The opening was at The Larnaca Municipal Theatre on the 9th of September. It was a lovely party, with the Larnaca municipal band playing in the background. The next 2 days saw sessions from all the speakers at the Sun Hall Hotel conference room, with questions at the end of each speaker's dissertation. Then there was the formation and organisational meeting of the International Stoic Society. The closing was at the Larnaca fort, with a reception and performance by Diastasis, a Cypriot song and dance group, who's performance was superb. Thanks are due to Demetrios Pierides, President of the PIERIDES Museum for his sponsorship and excellent hospitality. If you are interested in joining the International Stoic Society then click here. If you wish to view or participate in the society's Stoic Forum, click here. I love this, I think I must be a closet stoic. The universe is a living thing, endowed with soul and with reason"
I have filched some information below from a site about Zenon (with permission of course) for your delight. To see the whole thing you could go to 'members.aol.com/Heraklit1/zeno.htm' but it is now (2018) gone. It was well worth the read, and also the words and history of Marcus Aurelius . The Stoics are best known today for their ethical views on the acceptance of fate. These views derived from their belief that the universe was an animate and rational Being pervaded with soul. The Stoic philosophy was the closest thing to an organised religion of strict pantheism. The central beliefs were that the cosmos was a divine being, endowed with a soul that was made of a refined form of matter. Our role on earth was to accept and live according to nature. The Stoics also believed that we should accept our destinies unquestioningly, since they embodied the will of the universe: for that reason their name became synonymous with patience and long-suffering. Many of their theories were striking forerunners of modern science. The theory of a recurrent cosmic conflagration, for example, could turn out to be true - if the density of matter is high enough to cause a re collapse of the universe. The Stoics also believed that the sun was a sphere of fire, larger than the earth, and that the moon shone with reflected light. Dr David Sedley Christ's College, Cambridge. Stoic texts and ancient political philosophy. Co authored with Long source book for texts. Professor Anthony Long University of California-Berkley. Has authored with Sedley. Source book on Stoic texts. Friday September 11th 7-9 p.m.
For the past thirty years one of my life's goals has been to revive the spirit of nobility and Stoicism as a source of strength for our world leaders and citizens. I am interested in meeting others who are interested in a Stoic Revival. I feel that the importance of virtue is often underplayed in our modern world by weak politicians who are controlled by their desires for material comforts. government and business who best live up to concepts originally laid down by Zeno of Kitium. Or If you are interested in joining the International Stoic Society then click here.